Since 1966, each year in the UK we are greeted to the spectacular sights of the Notting Hill Carnival as the streets fill with revellers dressed up in Samba style showcasing their best moves, but for a street festival with an even richer history and lots more people you will want to pay a visit to Rio de Janeiro in Brazil with this slot from WMS being based on the Rio Carnival that began in 1723. The Rio Carnival is held each year before Lent and is the largest carnival in the world with over two million people taking to the streets each day to create vibrant scenes with musicians, dancers, and very impressive floats making it a sight to behold, and you’ll get to witness stunning dancers shaking what their mamma gave them on the reels. With an upbeat Samba soundtrack composed with agogos, tambourines, snare drums and bass drums which are so commonly played as revellers make their way through the streets, you cannot fail to be impressed by the energy on these vibrant reels, and that’s before you set sight on the exuberant dancers strutting their stuff. 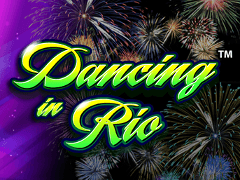 Dancing in Rio is a 5x3 reeled online slot containing 40 fixed paylines and you can join the celebrations from as little as 40p up to a maximum of £50 each time. You won’t be disappointed either as discovering masks can bring you up to 50 free spins and there are several jackpots to be won, including a progressive for those of you playing for £2 or more per spin – hit that and you’ll be dancing all around your house! The Dancing in Rio logo can be seen on top of the Brazilian flag and this is the Wild symbol with the power to substitute for all others aside from the Scattered mask symbols, but it’s the Stacked dancer who will impress you the most with her perfect body and incredible costume. There are two other female dancers as well as a man for the ladies amongst you to ogle at, with Ace to 9 icons ruining the stunning sights – these could have been replaced with headrests and many other items! As you strut your way along the streets of Rio you will be surrounded by revellers wearing an assortment of face masks and headrests, and should you manage to find three or more face masks (Scatter symbols) which have fallen off on the ground at once you’re in for a treat with a fantastic free spins bonus game which never fails to see you dance in delight. A minimum of three masks are required with higher rewards on offer for the more that you discover, plus there are special mask symbols with a number on them of either +2, +5, +10, or +20 which provide you with bonus spins on top of the initial number of spins that you’ve won. One party pooping aspect of this feature is that there are no multiplier bonuses applied to your winnings, however it is possible to retrigger the feature to prolong the festivities well into the small hours so we can’t be too greedy, can we? Yes, you that correctly, there are seven jackpots on offer when you play the Dancing in Rio slot machine. These include the Mini which is worth 20x your stake, the Minor being worth 25x your stake, the Major is worth 37.5x your stake, the Burst jackpot pays 133.5x your stake, the Pulse sees you dance to the tune of 500x your stake, while the final two will depend on your stake. Betting below £2 per spin offers you the chance to win the Surge jackpot, while staking above that enables you to win the fabulous progressive jackpot. Now you know how much the jackpots are worth, it’s time to learn how to win them. To the right of the reels you will see different patterns with green filling specific reels according to each jackpot and should you manage to match this pattern on the reels you will win the corresponding jackpot, with the progressive requiring the first four reels to be green and the fifth reel to be red – a pattern that will have you dancing in delight as a progressive jackpot winner! What a spectacular sight you are about to witness. The reels are awash with vivid colours just like the streets of Rio are each and every year and with free spins and several jackpots included, this is a street party not to be missed!